I want to visit Abruzzo in warm months, to buy live Dover sole from fishermen who sell the night’s catch from their small boats on the beach at Francavilla al Mare in the morning. And then I want to cook and eat that fish, in a small house with doors facing east, smelling salt and feeling the dull rumble of waves. And then I want to travel slowly away from the coast, along the narrow stone streets of Tortoreto, through the verdant, hot Abruzzo, past palm trees, up steep sunny hills toward the Apennines. Winding away from people and coast into farmland, ending up among patchwork houses with roosters and goats in scrubby fields, down tractor paths with no cell phone reception, almost lost, with only a vague knowledge of where to procure dinner. My travel in Abruzzo has been limited to winter. I feel a dominance of mountains and cold: inland Abruzzo in winter can be a hard place. Down narrow roads away from civilization I feel isolated. Restaurants are empty. The kinetic energy of the topography suggests earthquakes. Broken, uneasy. In January the coast looks built-up and abandoned, giving the weird pleasure of loneliness. A warm counterweight to all that is bleak about winter in Abruzzo is the blatant, tangible generosity: such friendly people! On my final evening in the region’s northern corner, the proprietor of Pizzorante Zio Mamo (such an awesome name!) presented the gift of a little jar of spicy fat, clearly locally made. It made me feel accepted. After only a couple of meals together he offered me something very specific and real. It felt like recognition of like-mindedness. Or acknowledgement that we both really like drinking good Abruzzese wines and eating big meals. But damn! No pizza that night. Instead he made goat slow-cooked with peppers, which is a specialty of Neretto. Far from home and completely wrung out/exhausted by travel I felt comforted by friendly restaurant people in a small town, locals that embrace outsiders like new regulars. It is a view of the best of Abruzzo, its uncommon kindness. Abruzzo feels like a compressed version of my native North Carolina. Mountains and sea are often in sight of each other. The hills close to the Adriatic are full of small farms that grow kiwis, apricots, plums, olives, grapes, dozens of appealing edible things. The fertility and abundance of their agriculture is remarkable in a region of dizzyingly uneven topography, land at points barren and hard. I feel close to farming in Abruzzo. Agriculture is relevant and alive in the communities I visit, a source of intermittent abundance if not material prosperity. Ensconced in happy isolation in the small hill towns of northern Abruzzo, I was in communities on the border with Le Marche. It’s a normal agricultural part of Abruzzo, not a bucolic idyll, not so much rural as remote. Tasting at good estates in this hilly area you find products reminiscent of the better wines grown in Umbria, Marche, even Tuscany. 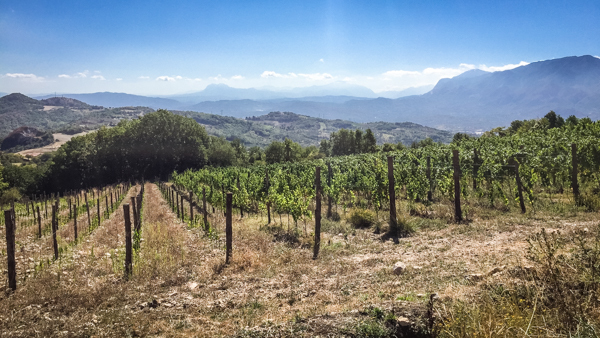 Valid, distinct wines are made in hearteningly quality-oriented ways in Abruzzo’s mountainous northern corners. In the provinces of Teramo (particularly), Pescara and l’Aquila very good wines are in decent supply. But the global reputation of wines from Abruzzo is battered by the sea of very ordinary wine made far to the south, mostly in the province of Chieti. Our relationship with Abruzzo is young. We’ll be back, many times. Maybe even in summer. Many people are making good wine on the hillsides of Abruzzo. They make possible a different future for a region that needs to escape bulk wine practices and the dominance of a few huge cooperatives to achieve real prosperity. So we picked out a few small-estate wines to sell in America. Eventually we will add more, because these are a part of our dream: to import sanely priced and diligently farmed wine from small estates, to eat with pizza. I always forget to emphasize the pizza. It’s a bad habit. Why do wine people shoehorn everything into French molds? It’s an intellectual shortcut. We lose nuance in the process. Still… a few days into my last trip through Friuli, tangible shape emerged. The hilly, marl-rich areas of Collio and Colli Orientali contain all the “grand Cru” sites, at least for white wine, and the more alluvial, lower elevation areas (Isonzo, Grave) are littered with “premier cru” equivalent fields. Special places, for sure. Like all gross generalizations, this lobs off outliers and quirky exceptions, but the short-hand worked for me. Friuli stopped being a blob on the map and became structured. I’d bent it to fit within the confines of my limited human understanding. More importantly, Friuli is one of the very best white wine growing regions in the world. In the very top small handful. Why? Definitely Ponca plays a part. It’s calcareous marl, a porous and character-laden soil type that limits yields and enhances the tertiary hard-to-define specialness of Friuli’s top whites. Also, elevation: Friuli is hilly, the nights on these slopes are cool enough for wines to remain vibrant. Recently, Friuli has been suffering the heat-excesses of climate change, a crisis of character for the region’s lower-elevation areas. Like Alto Adige, cool air flows through the region and allows for a longer, slower ripening season. From the border alps to the Adriatic across Friuli, wind minimizes rot, mitigates temperature extremes, makes farmers happy. Many of the conditions that shape the best wines of bordering Austria and Slovenia are present in Friuli. Contact with these winemaking communities is a key element of Friuli’s appeal. Friuli is a cultural crossroads, the character of its wines as shaped by Austro-Hungarian and Slovenian traditions as by Italian archetypes. Exposure to the people, cuisine and wine passing along trade routes for generations gives a complexity to Friuli and its wines. Awareness of the world beyond the borders, ambition to create wine of global appeal. And of course, grapes. There is no shortage of excellent raw materials in Friuli’s fields. Some are intensely local: Friulano, Schioppettino,Verduzzo, others absurdly international: Pinot Grigio, Merlot, Sauvignon. In some corners of Friuli, these and a dozen more distinct and worthwhile varieties thrive. Friuli makes each its own. The imprint of a special, great wine growing region is clear. Valtellina is a rare west-east valley in northern Italy, bordering Switzerland. The natural border is formed by the Alps: go over the top and Switzerland begins. Surprisingly, Valtellina and the Grissoni area of southern Switzerland were a single political entity for many centuries, until 1800. Switzerland (and of course Italy) are relatively new countries. Splitting the region along the Alps made even more sense because the Grissoni are Protestant, Valtellina Catholic, with all the attendant violence and hatred that engenders. In fact, the people of Valtellina were not satisfied with the Alps as a wall keeping away their Protestant former countrymen. So they built a wall of churches. Climb to the top of ruined Grumello castle and you can see them, onion domes and bell towers dotting the townscapes at an interval of perhaps a quarter mile. Some towns have less than 10,000 inhabitants and four or more large early 19th-century churches. Sassella (the cru wine area) is a church, and a mediocre over-priced restaurant. Nebbiolo has grown in Valtellina since 1200. It was first cultivated by the abbeys of the region: a familiar story. The valley has a couple of vital features. At the western end sits lake Como, vast and relatively warm. Air flows across Como and down through the valley, moderating temperatures in Valtellina’s fields. Go far enough east and winemaking towns give way to skiing meccas, centers of tourism. The land rises, and the air grows cool. All the vineyards in this area are planted on the steep northern hillsides of the valley, essentially south-facing. The valley is wide, with towns and arable land/vegetable gardens dotting its flat base, following the river. The vineyards get unfettered sunlight, light that heats rock and makes the name Inferno appropriate. In the summer sun, these fields are hot. Cactus grow. many of Romagna’s leading estates are pushing ahead with an increasing amount of quality French varietal bottlings. A familiar pattern as exists across much of the 21st century wine landscape. to France. It is the belly of Italy, a land that may rank first in importance among twenty fiercely local and quality-obsessed regions of this great peninsula. To an outsider, the raw materials of Emilia-Romagna make it a primary destination for hungry tourists planning Italian holidays. The raw materials of the region deserve the sort of diligent protection one would grant a UNESCO world heritage cultural site. Some of the oldest vine-growing artifacts have been discovered in Austria. Celts and Romans farmed vines here. In Austria (like in Italy, France, and Germany) monks tended the vines and developed the winemaking traditions. Austria had a history of fine wines, but when the Austro-Hungarian empire fell with the Treaty of Saint Germain in 1919 their wine traditions began a steady decline, hitting rock bottom with a wine scandal in 1985. But the modern era of quality viticulture across the nation really began in 1985, after a scandal involving the adulteration of cheap, bulk juice through the addition of diethylene glycol to make the wines taste sweeter. This incident caused the total collapse, and subsequent reorganization and radical reform of the industry from top to bottom. Today’s exceptional quality standards across the Austrian wine community are directly related to this reformation. Austria has become a shining light for what is possible through change and devotion to the land and the vines. is very mountainous, with only 28% of the land being flat. There are four seasons with quite cold winters and sunny warm summers. In many of the top wine growing areas average summer temperatures can be in the high 80’s Fahrenheit. wine made from these grapes is white. The wines are higher in alcohol than the wines of Germany and dry, with the exception of dessert wines made with the assistance of botrytis (noble rot) or through drying on straw mats, a practice still relatively common in Neusiedlersee. Austrians make wine from many of the same grapes used in Germany. Riesling is considered by many to be the white grape most capable of conveying the innate qualities of the land in which it grows. It has the ability to make wine of character and class at all points along the sweetness continuum, and is also prized for its ability to make some of the world’s most age-worthy white wines. The Saar is a small valley of a river that is essentially a tributary of the Mosel River in southwestern Germany. The region has been in the shadow of the much larger Mosel wine growing area for much of its history. The Saar’s wines are notably different, sometimes brighter and more mineral. The area has several truly great and justifiably revered sites for Riesling cultivation. In short the Saar deserves more respect than it currently gets, and certainly doesn’t deserve to be simply lumped into the Mosel: it is a distinct and special place. Wine people share a fetish for maps. I love maps. That said, if you are knee-deep in a website like this one, you probably know where Tuscany is, and what it looks like. So we’ve decided to have fun with it, to share our “mental maps” and various drawings of the places our wines come from instead of the typical topographic/appellation-laden cartography that graces the pages of many a fine importer’s website. This is a leap for us. It feels weird. Our instinct was to bog down in the details: we are wine nerds, too. Help us out by cutting a little slack at first: this part of the site will grow and change, and I dream of it becoming a beautiful little corner populated with imagery from your minds as well as ours. Which leads to my other point. Send us your renderings of favorite wine lands in Europe. We’ll post them (as appropriate to our product catalog) and I think will grow a more compelling view of where wine comes from in the process. In summary: need a detailed map? Hugh Johnson and Jancis Robinson have you covered, or even Michelin. Need a weird, bordering-on inept sketch of what it feels like to be on the ground in these vineyards to us, including rough approximations of where our farms are landed? Perfect! Here you go. Can arguably the greatest of all Italian wine regions also be somewhat undiscovered by tourists? We are there in the off-season. During the heady days of harvest and fresh white truffle season our producers are far too busy. Incredible landscapes, architecture, food that is distinct and still incredibly Italian: the place is amazing. The history is perhaps Italy’s most fascinating, the culinary history even more compelling. Elements from at least three modern nations are knit into its fabric. Border regions, like wines made at the threshold of where grapes are a viable crop, these are the most interesting. It’s not just diversity at the margins, it’s cross-pollination and creation, the possibility of something completely new. 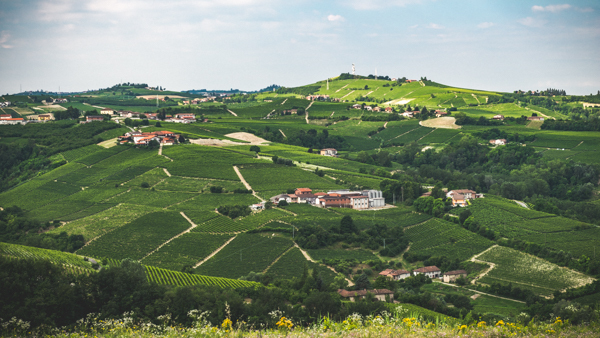 An obsession with the Italian Piedmont begins with its depth. There are an overwhelming number of outstanding producers, legendary and obscure, making wines to take home and drink right away or in a decade on the perfect day. After multiple visits and decades as a fan from afar we still find new grapes in the Piedmont that are compelling in new ways. And there are of course margins to the Piedmont, areas away from Alba that for centuries have made valid, authentic expressions of Piedmontese wine. In some ways Piedmont itself isenough for a lifetime, if it wasn’t attached to 19 other fascinating regions to dream about. It is the heart of Italy. It looks so Italian. That’s a dumb thing to write, but I think it’s also kinda undeniable. I may be one of a billion people dreaming of a future in a house on a remote Tuscan hillside, surrounded by silver-green olives and wild, gnarled old bush vines. Tomatoes and persimmons, Sangiovese and cinta Senese pigs, maybe a rooster or two…. Anyway, where were we? It just stays so perfect. Centuries of tourism, (intra and inter)national conflicts, changes in climate, economy, society: after all this Tuscany looks like you should ditch everything and paint it. Safer than biking through it, narrow roads that dip and climb and bend with the topography, fearless jet-fueled truck drivers that blur past by at a distance of centimeter, thumping bursts of adrenaline that will get you to your destination… but unscathed? It is still an adventure, at the center of the universe and wild, farmland and the heart of western civilization in a tangle. I love it, I totally buy into it 100%. This is a place for me. The real food of the region when you find it is solid and refined, seemingly simple things like beans or beef elevated to a pure form, the kind of unflashy food that doesn’t read well but that your body totally craves after an encounter. The elevation of the basic to profound through centuries of thought and diligence. Taking nature and honing a thing until it becomes the ideal. Sangiovese is the same. In some fields in Chianti worked by the right hands it has an undeniable resonance. It resists adjectives, a pure form that causes fumbling use of descriptors like classic or archetype as futile place holders. The thing I like about the best Tuscan wines (and all other great wines) is that whether you and I like them makes no difference. They exist outside of our petty observations. It hooked into my heart pretty quickly. Puglia resonated and within a day I felt affinity for all of it. I like it more because it is flawed, scrappy and proud and ugly. The baroque hillside town of Mottola, ringed and woven with stone roads worn smooth. Exotic, rustic, Alberobello, an otherworldly architectural wonderland. Even Foggia, a dirty anarchic small agricultural metropolis. The energy of the place is amazing, its blatant fertility. It reminds me of why I feel at home in the heart of the American south. Arriving from the north Puglia is at first flat and green, verdant blankets with dark brown earth underneath and a hilly rocky coastline. Olive trees appear, then stones, then stonewalls, then huts, until you are lost in a blanket of vines and trees. The land rolls, big bland tourist cities pop up in coves and disappear quickly enough. Ruined stone buildings are everywhere, places to stay…. Antennae jut from a crest of piled up buildings, a very third-world skyline. Hidden in the jumble there is an ornate church and beautifully ruined sprawling aristocratic home, incongruous, unexpected. Orange groves, clusters of modern industrial ugliness and unfortunate abandoned construction, all saved by the beautiful light. Puglia has lots of stray dogs. There is an irresistible quality to the region. It is a place on earth where you can feel more alive just being there. 500-year-old olive trees. I think we do not value this enough. Farmers in Puglia agree, feel out-of-step with our low-cost at-all-costs world. But really a lot of them persist, willing to make a pure, beautiful, and timeless thing in spite of little-to-no economic reward. The great old bush vine Primitivo and oil from an ancient tree is this region’s unparalleled contribution to life on earth. We will one day create a different name and a different category which untethers these foods from their bland commercial equivalents, cheap industrial facsimilies also called wine and olive oil. There is no equivalence, and the imposters only deplete the value of the authentic fruits of nature. A linguistic separation could elevate esteem for the work of Puglia’s real long-term residents, standing mute and gnarled and imposing across hearteningly vast stretches of Puglia. These fields of old vines recede, yield to machines and wires and half-thoughts of buildings. Puglia is vast and fertile, and decades of neglect can’t kill it. I think we will turn the corner to appreciation of its unique virtue and greatness very soon. Truthfully, I’ve yet to get a handle on the Veneto. I’ve been there, kicked around, even bought some wine. I have indelible memories. Numbingly cold snaking stone alleys of Venice, wandering long past midnight to rid myself of jet lag and excess calories, wondering what small clusters of Venetians retreating along separate paths could be discussing as they faded away in an eerie watery maze. Late winter snow on low mountain roads, frigid air from the Dolomites stinging my ears, cotton white clouds rolling over black, sheer stone cliff faces dimly outlined by moonlight. Lime green pastures approaching the Colli Eugenei. It’s a place for which I’m still building framework, context. The Veneto makes more wine than any other region of Italy. And by extension, most countries. Sneakily. Not every year, Puglia and Sicily make it sporting. Everything exists in the Veneto: plenty of the very bad, also many of Italy’s absolute best. Industrial farming for junk wine, and the small, special, distinct and memorable wine that makes Italy compelling. Several of Italy’s most vocal and well-respected natural wine advocates make wine in the Veneto. True as well for the largest co-ops and a handful of staggeringly enormous privately held wine producing entities. Veneto is a big and diverse region, meaning terrain suitable for scads of grapes varieties can be found. Along its southern border, the Po valley is remarkably flat and looks unpromising for wine… except for little clusters of volcanic hills like the colli Euganei. At least three mountain ranges cover a third of the region. To the far east, capital city Venice is surrounded by lagoons, swamps, ponds, coastal delta. Not a surprise that basically every type of wine you can imagine is made, and usually made well, in the Veneto. Rich reds (Amarone, the Bordeaux blends of the colli Euganei), light reds (Bardolino, Valpolicella), every conceivable style of white (Soave, Lugana, Bianco di Custoza), funky tasty pink wines (Marzemino), viscous dessert bottles (recioto, passito). That barely scratches it. It’s a lot to take in. You’ll have to travel there, multiple visits. You’ll have to venture from the oenotecas of Verona and crowded restaurants of Venice to explore high hillside fields in the shadow of mountains, cool steep locations growing Glera for Prosecco. You’ll need to do some homework. It’s a big dizzying pile of wine and you only get one liver: consult a reliable guide! And have fun. The Veneto was its own kingdom for more than a millennia. It resists homogenization admirably, and stands out as an essentially Italian, yet fiercely local and clearly defined part of the nation. Trentino-Alto Adige is a fabrication, an awkward collision of two areas (Trentino to the south, Alto Adige to the north) with completely different cultures and histories. a wine grower can see the region has potential to make really exceptional wine. Words like precise, expressive, and well- balanced are appropriate to describe the region’s best wines. and aromatic wine style that accentuates the strengths of their terroir. For this reason, the wines of the region are not well- known in the U.S., a contributing factor to the relatively low cost of decent Santa Maddalena. Tourists stick to the Amalfi coast like flies on a blob of spilled lemoncello gelato melting in the July sun. In high season it can be a crowded, sweaty, vividly beautiful place. Citrus, turquoise Tyrrhenian Sea, Capri. The appeal is easy to understand. I prefer the warren of neighborhoods in places like Gragnano and Pozzuoli, the not-so-pretty mirror image of Amalfi. But hey, I’m here for the anarchy, fizzy red wine, and pizza. Once shunned, Naples is now the trendiest of holiday destinations. Irrepressible energy and complete resistance to the homogenizing forces transforming much of even Italy into dull interchangeable prefab city components make this chaos of a metropolis refuge for seekers of authenticity, and pizza. But we’re not concerned with these places. Vines thrive high on the dormant volcanoes of Campania’s interior, a land of rich soil and history, fiercely protected and world-renowned food traditions, and pockets of endemic poverty. Places where your cell phone still won’t work. A land less changed than the region’s western coast. Medieval stone hilltop villages, native grapes, mozzarella di bufala seemingly for sale in shops at every crossroads. And pizza. Come to inland Campania for the Falanghina and Aglianico, but stay long enough to explore Fiano and Piedirosso, and Barbera di Sannio. It takes time on remote mountain roads to realize this is often a cool-climate vine growing region, that elevation and coastal breezes make it necessary to pick grapes for the best wines of Campania pretty late in the season. Low pH soils add lift to vino designed to make better local specialties like mortadella panini, penne pasta in marinara made spicy by chunks of tiny red peppers cut fresh atop it a tavola with kitchen shears. And pizza.